We have many options for the perfect Chicago gift that matches your occasion & budget. For a Chicago visitor, or a former Chicagoan, we can create a Chicago gift basket or provide music, books & other gifts as Chicago mementoes. Only a sampling is shown. Contact us for more ideas. 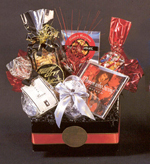 We can provide food items, giftware, gift baskets, and even souvenirs that meet specific needs and budgets. Whether a gift is meant to welcome a business visitor or event attendee, thank a featured speaker, acknowledge a sponsor or volunteer, we have what you’re looking for. We can also suggest gifts to reflect specific industries, professions or event themes. Many iconic scenes of Chicago have been created and reproduced by a well-known artist. All can be personalized with a company or event name, date or whatever commemorates the occasion. There is a 4-pc. minimum plus a studio fee for personalizations. Reproductions can be purchased as is without any personalization. Contact us for other available images. Personalizations--$60.00 one time charge. 4-pc. minimum. 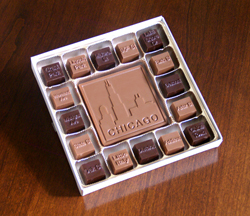 These special confections are molded with the Chicago skyline in the center square, surrounded with smaller solid chocolate cubes, each sporting the name of a well-known Chicago street or location. Available in either all-dark or all-milk chocolate or combined as shown. Gift boxed. Kosher. 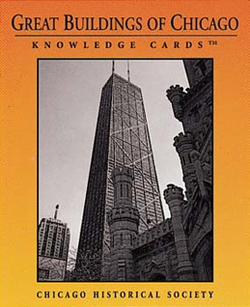 This deck of cards from the Chicago Historical Society presents photogrtaphs of and historical and architectural information about forty-eight of Chicago's finest buildings. On one side of each card you'll find a beautifully detailed photograph of a facsinating building; the location, architect's name, building dates, and structural design are noted on the back. Size: 3.25" x 4". 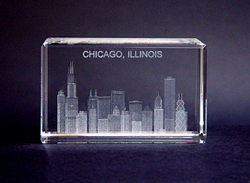 3-dimensional Chicago, Illinois Skyline is laser-etched in lead crystal. Can be customized with company name and/or logo. Varied sizes, shapes and pricing available. $23.00. Additional cost to customize. Phone for details. 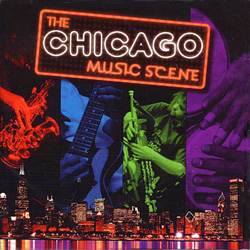 We stock a collection of Chicago-oriented musical CDs. A great reminder of Chicago and its rich music scene--small enough and lightweight enough to easily pack in a suitcase or carryon. Have you seen our other Chicago products?